Hopefully a flick through the pages of the ebrochure above will explain why you have to visit the remote and mysterious Kingdom of Bhutan. It is a country like no other, steeped in history and religion, tucked away between towering mountains, yet with an authenticity that is hard to find in an ever diminishing traditional world. For photographers, Bhutan is Paradise - or should we say ‘Shangri-la’? There is so much to point your camera at, from the local people in their traditional dress to the imposing ‘dzongs’ or fortified monasteries clinging to sheer cliffs. However, don’t come just to take photographs. Come to experience a truly unique part of the world. Immerse yourself in the Tibetan Buddhist culture that values kindness, walk across the bare wooden floors of ancient temples, listen to the drums, bells and horns underneath the rhythmic chanting of the crimson-robed monks. 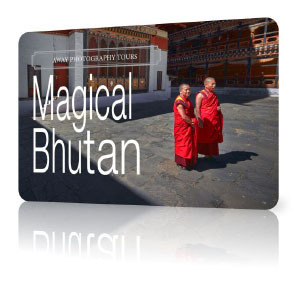 We travel in Bhutan with Illuminating Tours and our head guide, Namgay. We visit his family village as well as the most famous landmarks, so we don’t just see the touristy spots, we get a taste of real life in Bhutan. However, we travel in comfort. Our tour has six comfortable vehicles, each with two guests, one guide and one driver. The guides include Peter, David and Namgay. All the drivers are Bhutan locals. It’s a great way to get around the country. The 3 to 4 star hotels are clean and comfortable, we have one night in Namgay’s village, the food is excellent and there are lots of opportunities to purchase souvenirs. However, the biggest thrill will be the friendly locals and photographs you capture while travelling through Bhutan, the land of the thunder dragon. Minimum of 8 participants (plus tour leaders), maximum of 12. For further information and bookings, contact Kim on 02 4388 6851 or kim@betterphotography.com.